These unique orthotics provide instant, effective, support for immediate comfort and more natural foot function. Innovative design helps improve biomechanics, relieving pressure and offloading uneven stress on the forefoot. Ideal for bunion sufferers. 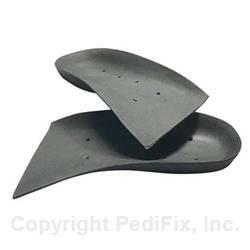 Arch Support lifts weak or flat arches to ease heel, leg & lower back pain. Deep Heel Cup helps stabilize feet by aligning them with the ankle, knee, and hips. 3/4 length style fits atop existing shoe insoles. Position each Action Orthotic with the heel of the support snugly against the heel of the shoe and the raised arch along the inside edge of the shoe.